HUNTINGTON, W.Va. – Marshall athletics mourns the loss of former Marshall softball player Emileigh Cooper (Jackson, Ohio). Cooper passed away Friday evening due to injuries sustained in a car accident. Cooper played from 2012 through the 2015 season for the Herd. Her senior year was a career best as she hit .434, good for second all-time in program history. She was one of a Marshall-record five players to record 50 or more hits (53) with five doubles, three home runs and 12 stolen bases. She spent most of 2015 batting in the nine spot giving Marshall an extra offensive weapon to help turn the lineup back over to the top. Cooper was a major driving force behind the best offensive season in Marshall softball history. 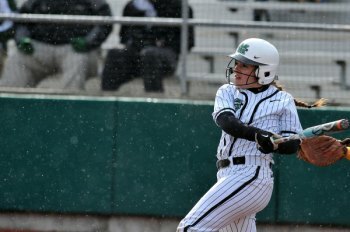 Herdzone.com columnist Jack Bogaczyk featured her amazing season in a story from March 18, 2015.
Cooper helped the Herd achieve greatness by advancing to the Conference USA Tournament Championship Game three-straight seasons (2012-14) and winning the title in 2013. Marshall advanced to its first ever NCAA Regional tournament in Lexington, Ky. She scored the second run of the game against Notre Dame in the Herd’s 3-1 win over the Irish. In 2015, Cooper was named to second-team All-Conference USA as well as being selected NFCA Mideast All-Region second team. She was a four-time member of the Conference USA Commissioner’s Honor Roll and was a C-USA Academic Medalist in 2012. Cooper was named a NFCA All-America Scholar Athlete in 2012 as well.